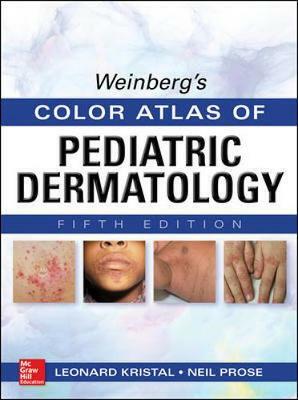 More than 1,000 superb full-color photographs help you diagnose common and rare pediatric skin disorders Weinberg’s Color Atlas of Pediatric Dermatology, Fifth Edition delivers an unsurpassed collection of more than 1,000 full-color images that provide invaluable guidance for the diagnosis of both common and rare skin disorders of neonates, infants, and children. Trusted by clinicians for more than forty years, this classic reference has been hailed for its clear, high-quality, full-color photographs and concise yet informative textual summaries. For each condition reviewed in the text, one or more clinical photographs are included, making differential diagnosis faster, easier, and more accurate. A brief, yet thorough overview of important clinical features, etiology, prognosis, and the most current therapeutic approaches is included for each disorder illustrated. Every page reflects the book's magnificent atlas format, with photographs linked to concise text that authoritatively describes the condition illustrated in each image, along with, in most cases, a one-sentence summary of suggested treatment protocols. Features: More than 400 new full-color images to facilitate speedy diagnosis New treatment modalities are included when applicable, reflecting the very latest clinical findings and treatment guidelines Revised and refreshed legends throughout the text highlight the latest thinking in pediatric dermatology practice An essential resource for patient education If you are searching for an up-to-date, time-tested, visual resource that has been enthusiastically received by your colleagues in dermatology and pediatrics, your search ends here.